The mainstream beer cookbooks currently on the market all emphasize the word “beer.” It’s usually the biggest word on the cover and photos of frothy pint glasses or designs featuring bubbly golden liquid backgrounds are main selling points. Most of the recipes inside these types of publications reflect this booze-appeal marketing tactic and are usually just regular comfort food findings — cheese fondue, meatloaf, chili — that have added a generic call for “beer” as an ingredient. Thankfully, though, Brew Food — the latest book from San Diego’s beer-loving book company Chef’s Press — goes beyond the novelty of “You can have your beer and eat it too!” and pushes the concept of using beer in food to new, delicious try-it-at-home heights. 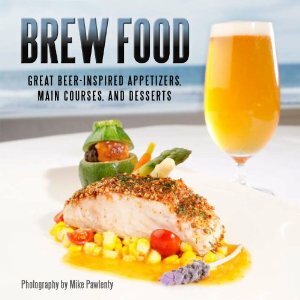 A collaboration between San Diego County’s biggest brewers and some of its most prominent chefs, Brew Food is one of only a few books in the cookbook world that treat beer like wine and feature recipes tailored to utilize the flavors of specific brews.